I wanted a larger folding knife for edc. I looked all over the net read tons of reviews and watched countless videos of all the top name brands. I picked the Spyderco due to weight to size ratio and let me tell you this knife is a tank. It is so well made that I feel it is a great value for what you get at such a low price point. It is large enough to do it all from cut rope to open boxes to fighting off the random bear attack. Blade lock up is great no wiggle at all left to right and sharp out of the box. If you have small hands I would not suggest this knife but for someone with large hands this knife will serve you well. Keep in mind that this is not a Sunday go meeting blade---but a working tool---as long as you keep that in mind I would suggest this blade to anyone. Matter of fact I plan to buy another just to have a spare should something happen to this one. Got the XL a few months ago after hunting fruitlessly for a Chinook for several months. Why a Chinook? I was after a rock solid backlock seemingly strong enough to execute a backcut - not that I would ever have the inclination to ever use a backcut! Was just after a bankvault-like backlock. Then I realised that my original Manix used the same platform as the Chinook. So I EDC'd my 4mm thick S30V Manix for several weeks. The broad leaf shaped blade of the Manix never really appealed to me, but I took a liking to it after purchasing a Manix Blue lightweight overseas last year and abusing my Manix on a 2 week camp and a weeklong roadtrip. But before camp and roadtrip I go some withdrawal symptoms from not getting a new blade in a few months, so I "settled" for a Manix XL. Having had the opportunity a few months ago to pickup this knife - I didn't because a hated the jeweled look of the in-handle jimping - way to shiny and blingy! So you see my reluctance in settling for the Manix XL. I have EDC'd the damned thing every day since I got it (barring camp and roadtrip). I have also made up my mind that it is one of my goto knives for "those unplanned camping trips in the Hadramaut Valley"! This is a helluva knife and beats my original Manix 95 hands down due to the ball bearing lock, lighter overall weight and thinner blade (giving much improved non-camp cutting performance). Have again EDC'd my Manix XL for several months before a overseas vacation and 3 weeks after. Incidentally I had to EDC my Benchmade Pardue 3550 when overseas. But the Manix XL continues to impress me. Sal and Eric really nailed this one. 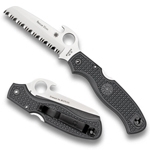 Its pros include: S30V blade and Spyderco heat treat, FFG blade, large blade, finger choil, g10 handle scales, ball bearing lock which I feel is better (stronger and more reliable) than Benchmade's Axis Lock and I wish that Spyderco would machine a Civilian in S30V and an axis lock! I'm still not sold 100% on the leaf blade shape, but for someone who's full of crap, the total Spyderco Manix XL package beats all my other folders including other Spydercos at this point. The feel of the knife in the hand is amazing, the knife is super solid.It is a major leap forward compared to the Manix 2 ( I own 1) the Manix XL grind FFG is much better than the hollow grind on the Manix 2 and the s30v is a better choice as well. 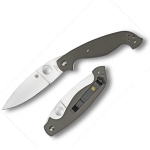 The handle is comfortable and the g10 along with the jimping on the liners makes sure it is not going to move. Overall the manix 2 xl is my favorite knife out of my collection and will be with me for a long time to come. I purchased my Manix 2 XL in Jan 2012 looking for a low cost alternative to the Strider SNG I had been using as EDC for the 1.5 years previous. I EDC'ed it from the time I acquired it. I quickly realized that for common everyday tasks, it was superior in nearly every way to the Strider. It still has its original edge and cuts effortlessly after 6 months. I also liked that it had the S30v FFG blade. The only gripe I have is with the size, for a folder its a big knife. This was the only area where the Strider excelled over the XL. Why didn't I just get the regular Manix 2 you say? Well, I'm just a sucker for flat grind blades. Initially, it felt slightly odd as it had a definite presence where the Strider simply seemed unnoticeable in my pocket. I quickly became accustomed to it and don't have a problem at all with the size. The XL's large thumb-hole also makes for easy and fast deployment. All in all I'm very happy with this knife and really have no drive to carry the SNG anymore. 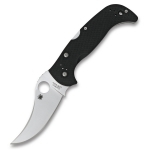 I highly recommend the Spyderco Manix 2 XL. Gave ergo a 9 for size.